Alzheimer’s disease was named for Alois Alzheimer, a German psychiatrist who published a report in 1911 about a woman who showed severe dementia symptoms. Along with his colleagues, he examined the woman’s brain following her death and reported the presence of abnormal clumps, which are now called amyloid plaques, along with tangled brain fibers called neurofibrillary tangles. Amyloid plaques, neurofibrillary tangles, and an overall shrinking of brain volume are commonly seen in the brains of Alzheimer’s patients. Loss of neurons in the hippocampus is especially severe in advanced Alzheimer’s patients. Figure 1 compares a normal brain to the brain of an Alzheimer’s patient. Many research groups are examining the causes of these hallmarks of the disease. Like Alzheimer’s disease, Parkinson’s disease is a neurodegenerative disease. It was first characterized by James Parkinson in 1817. Each year, 50,000-60,000 people in the United States are diagnosed with the disease. Parkinson’s disease causes the loss of dopamine neurons in the substantia nigra, a midbrain structure that regulates movement. Loss of these neurons causes many symptoms including tremor (shaking of fingers or a limb), slowed movement, speech changes, balance and posture problems, and rigid muscles. 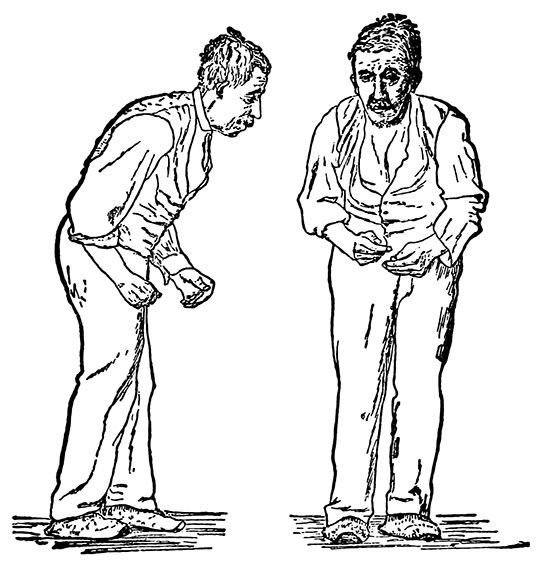 The combination of these symptoms often causes a characteristic slow hunched shuffling walk, illustrated in Figure 2. Patients with Parkinson’s disease can also exhibit psychological symptoms, such as dementia or emotional problems. Figure 2. Parkinson’s patients often have a characteristic hunched walk. Approximately three to five percent of children and adults are affected by attention deficit/hyperactivity disorder (ADHD). Like ASD, ADHD is more prevalent in males than females. Symptoms of the disorder include inattention (lack of focus), executive functioning difficulties, impulsivity, and hyperactivity beyond what is characteristic of the normal developmental stage. Some patients do not have the hyperactive component of symptoms and are diagnosed with a subtype of ADHD: attention deficit disorder (ADD). Many people with ADHD also show comorbitity, in that they develop secondary disorders in addition to ADHD. Examples include depression or obsessive compulsive disorder (OCD). Figure 3 provides some statistics concerning comorbidity with ADHD.